We are thrilled to announce the introduction of our monthly sustainer program, “The Red Ribbon Loop”! Your participation in the Red Ribbon Loop is an easy way for those looking to give, to help us continue our mission of caring for those living with HIV/AIDS. The funds raised from the Red Ribbon Loop are used to provide vital care to the those living with HIV in the 29 counties of Southwest Missouri that APO serves. You generous monthly financial contributions, helps provide the much needed support for the services we offer; such as education and outreach, prevention, medical care, and medication assistance. This support helps ensure we can help stop the spread of HIV/AIDS and continue to provide care to those currently living with HIV/AIDS in our communities. 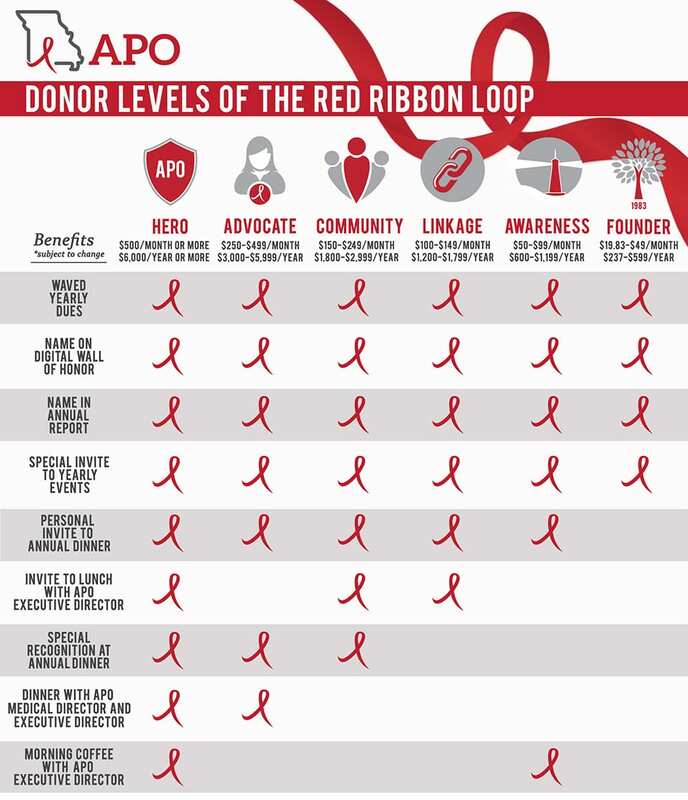 Won’t you become an active contributor to the Red Ribbon Loop? APO needs you now more than ever, but more importantly, our clients need you more than ever. Below is a summary of the benefits you receive when you enroll into the Red Ribbon Loop and become one of our amazing supporters.